An area measuring 22 feet by 9 feet just outside our kitchen, entering and exiting through our back door. 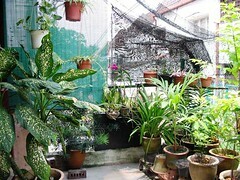 This is another gardening area at the back of our home that delights us very much, mainly because our lovable pet dog, Maxi, the resident king is here. Okay, back to the subject of our backyard garden, now lovingly known as Maxi’s Kingdom – this whole area had been cemented since 5 years ago to cater to our advancing age! :( We had found it rather difficult to upkeep, with the grass needing to be trimmed ever so often as they grow so vigorously in our wet tropical climate. 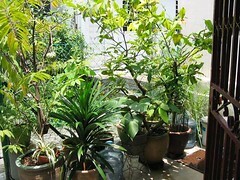 Moreover, it was frequently stagnated with tiny pools of rain water and looked so messy and unsightly! 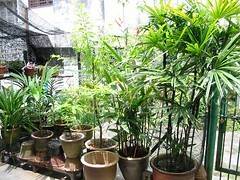 However, to counteract the heat and keep the back area cool, we’ve maintained a container garden at the backyard with emphasis on plants such as the Lady Palm, Heliconia, Dieffenbachia, etc. 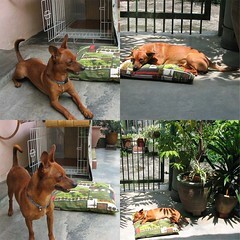 These will provide shade from the scorching afternoon sun especially for our pet dog! 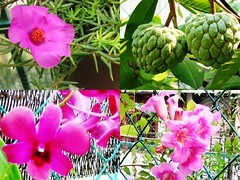 And, of course, a couple of fruit trees like Annona squamosa (Custard / Sugar Apple) and Syzygium samarangense (Wax Jambu, Java Apple) to whet our appetite and edible plants such as Pandanus amaryllifolius (Fragrant Pandan), Lemon Grass, Murraya koenigii and Tumeric for added flavour into our cooking. Hehe, ;) gardening here is more for practical reasons than anything else, though it does sort of beautify the backyard and delight our eyes! Here’s sharing pictures of Maxi, taken end September showing the ever faithful Sentinel on sentry duty and slumbering in his domain, just outside our kitchen! And some images of our backyard garden!